Brace Beemer's Lone Ranger, Hattie McDaniels Beulah and Lowell Thomas led Multiple Runs. From adventure to comedy to news to music, Multiple Runs had it all. Brace Beemer's Lone Ranger westerns, Hattie McDaniels' sitcom Beulah and the nightly Lowell Thomas newscasts were prime examples of the variety found in the weeknight Multiple Runs. 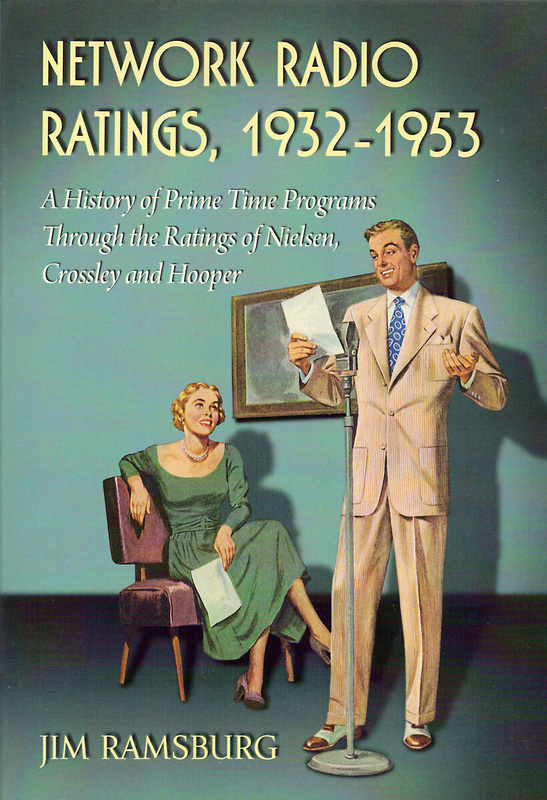 Multiple Run Programs are defined in Network Radio Ratings, 1932-1953 as prime time attractions that were broadcast more than once per week at the same time. With a few notable exceptions Multiple Runs were usually 15 minutes in length and aired before 8:00 p.m. Eastern. The majority of Multiple Runs were known as “strip shows,” identified on prorammers’ grids in one continuous strip across the board from Monday through Friday. Multiple Runs were also relatively inexpensive to produce which made them popular with budget-minded advertisers. Of the 24 programs that scored at least three seasons in the Multiple Runs’ Annual Top Ten, nine were newscasts that required only one talent fee and few additional production costs. And because 21 of the 24 were only 15 minutes in length - another was only five minutes - savings in network line charges over half-hour or hour long programs were substantial. These savings were particularly attractive to Procter & Gamble, Network Radio’s biggest spender in daytime serials. . Beginning in 1947-48, P&G bought a 45 minute block of CBS strip shows: Lowell Thomas News at 6:45, followed by Beulah at 7:00 and Jack Smith’s weeknight songfests at 7:15. Campbell Soup picked up the next half hour with Bob Crosby‘s Club 15 at 7:30 and Edward R. Murrow‘s quarter hour of news and comment at 7:45. But the longest running sponsor of any Multiple Run program was Sun Oil, which held Lowell Thomas News for 15 seasons, from 1932-33 to 1946-47. Thomas also holds the record as the only attraction to appear in the Multiple Runs’ Annual Top Ten for all 21 years of the Golden Age. That should provide a clue to who came out on top of the All Time Top Ten among Multiple Runs - as should the Monday through Friday All Time Winners found elsewhere on this site. It’s quite remarkable how popular these usually short and low budgeted programs were, considering that they were mostly heard early in each weeknight’s prime time schedule before the greatest number of listeners was available. Listed below are all 24 of the Multiple Run programs and personalities who scored at least three seasons in the category’s Annual Top Ten. Placing the group’s All Time Top Ten in order provides a real puzzle. Can you solve it? Hints: All but one of our All Time Top Ten were 15 minute programs and four were newscasts. What’s more, all but two were broadcast between 7:00 and 8:00 p.m. Eastern Time. Nevertheless, there are still one or two in the ten that may surprise you. The Multiple Run programs’ All Time Top Ten are revealed below the cover of the book that provided the information. 1/ Lowell Thomas News was a Network Radio fixture for 46 years - 1930 to 1976 - and, as previously noted, the only program to appear in all 21 Multiple Run Top Ten lists of the Golden Age. What‘s more, Thomas‘s friendly delivery of straight news in his distinctive voice was invariably broadcast at 6:45 Eastern, the earliest time of all major Multiple Run programs. Thomas was heard on Blue from 1932 until 1943 where he registered four first place seasons among the Multiple Runs, five second place finishes, one in third and one in fifth. .Moving to NBC in 1943-44, he scored two first place seasons and two in second. The newscaster’s final stop was CBS beginning in 1947-48 where his ratings drifted down to one fifth place finish, one in sixth, two in seventh, one in eighth and one in ninth The final three network tally for the King of Multiple Runs is 161 points. 4/ H.V. Kaltenborn’s news and commentaries weren’t scripted. Instead, they were extemporaneous lectures delivered with crisp diction by an expert in domestic and international affairs who knew his subjects and wanted his listeners to understand them as well. Hans Von Kaltenborn was a 52 year old editor of The Brooklyn Eagle with solid New York radio experience when he joined CBS as a roving correspondent and news analyst in 1930. He moved to NBC in 1940 and began his decade of highly acclaimed news commentaries for Pure Oil. Kaltenborn’s three times a week broadcasts registered eight seasons in the Multiple Runs’ Top Ten, three times in first place, once each in second, third and fourth, and twice in ninth resulting in 56 points. 5/ NBC News of The World debuted in 1940 as a once-a-week news capsule on Wednesday nights. When America’s involvement in World War II appeared inevitable in September, 1941, the program became a weeknight strip and remained on the air for the next 27 years. News of The World was similar to CBS World News Roundup with anchor John W. Vandercook calling on network correspondents for on-the-scene reports. The deep-voiced Vandercook left the post in 1946 and Morgan Beatty took over for the remainder of the program’s long run. During its dozen years in the Golden Age, NBC News of The World finished second among the Multiple Runs once, fourth once, sixth and seventh twice, eighth four times, and ninth twice for a total of 50 points. 6(t)/ Beulah was a failed half-hour spinoff of Fibber McGee & Molly that ended midway during its inaugural season of 1945-46 with the death of its star Marlin Hurt, a Caucasian male who played a jovial black housemaid. It was briefly revived on ABC in 1947starring Bob Corley, but was cancelled after 26 weeks. Procter & Gamble gave Beulah new life in late 1947 by converting it to a 15 minute strip show on CBS and establishing Academy Award winning actress Hattie McDaniel, 52, as its star. After a slow first season in seventh place among the Multiple Run shows, Beulah enjoyed two seasons each in first and second place and another in fourth for 49 points. 6(t)/ Jack Smith was billed as “The Singer With A Smile In His Voice” who starred in a 7:15 strip show for Procter & Gamble on CBS for eight years. On this list of All Time Top Ten Multiple Runs, Smith ties with Beulah which preceded his quarter hour for six of those seasons. Frequently hosting top guest stars like Margaret Whiting and Dinah Shore, Smith scored one season each in second, third, fourth and fifth place, plus three in sixth and one in seventh for his 49 points. 8/ Fred Waring’s Pennsylvanians, the ever-growing troupe of musicians and singers led by the handsome Waring, journeyed around the networks and various day and evening timeslots from 1933 until 1957. Liggett & Myers’ Chesterfield Cigarettes brought Waring to NBC in 1939 for a five year series of strip shows at 7:00 that mainly consisted of traditional, standard and novelty selections. a switch from the company’s typical sponsorship of pop music stars who appealed to younger listeners. Waring finished in third place among the Multiple Runs over two seasons and in fifth three time for 40 points. 9/ Gabriel Heatter’s nightly newscasts stood out for a number of reasons. First, it was heard weeknights in the heart of prime time at 9:00 Eastern for all but the waning years of the Golden Age. Secondly, during the World War II seasons, 1941-42 to 1945-46, Heatter added a sixth night to his schedule on Sunday at 8:45. Yet, despite the competition from Network Radio’s top programs, Gabriel Heatter became the Mutual Network’s only attraction to register on any of our All Time Top Ten lists. In Multiple Run competition his two finishes in fourth place, one each in fifth, sixth, seventh and eighth, plus two in ninth and three in tenth totaled 39 points. 10/ Club 15, starring Bing Crosby’s younger brother Bob, debuted as a strip show on CBS in 1947 for sponsor Campbell Soup. Bob Crosby had emerged from his brother’s shadow a decade earlier as the popular singing bandleader of the former Ben Pollack band, turning out his own share of hit records. Crosby hosted the show three times a week, sharing the duties on Tuesday and Thursday with singer Margaret Whiting Club 15 turned in a six year record of one third place season, two in fourth, one in fifth and two in sixth resulting in 38 points. The remainder of the Multiple Runs that compiled three or more Top Ten seasons yet failed to make the All Time list were Bill Henry’s five minute Johns-Manville News - 34 points, Chesterfield Supper Club - 32, soap opera Myrt & Marge - 31, Boake Carter News - 30, Edward R. Murrow News and One Man’s Family - 24 each, singer Lanny Ross, Lum & Abner and Wayne King’s Lady Esther Serenade - 20 each, Edwin C. Hill News - 19, Easy Aces -16, Mr. Keen, Tracer of Lost Persons - 10, Glenn Miller’s Moonlight Serenade - 6, and Fulton Lewis Jr. News - 4. * For an exception to The Lone Ranger’s broadcast schedule, see The Late Shift on this site.